Funny how life can come full circle. Things from childhood, that in your teens and early twenties seemed so passé, suddenly become desirable or enjoyable. One particular blast from my past, has always left me stone cold. The sunflower seed and its hippy chicky cohort, the pumpkin seed or pepita, as it is also known. Mum tried to sneak those little buggers into everything. Little parcels of them appeared in our lunch boxes, whereas other lucky children may have scored a chocolate teddy bear biscuit. They also crept into cookies, cakes, salads, breakfast cereal (not really but I bet she would have if she thought she could have.) These wee kernels stood for everything that, at the time, I totally didn’t get. (Physically and metaphorically.) Homemade, nutritious food in abundance, when all I really wanted was a store bought white bread tomato sandwich. And a Mars Bar. Our parents grew radiantly yellow sunflowers in our garden and we watched with fascination as they grew tall, blossomed and withered. We would watch their seeds darken, harden and grow as the flower matured. They also grew pumpkins, in varying shapes and sizes. Not even these living miracles convinced me it was natural to consume their kernels. For many years I have staunchly withstood the squeaky siren call of the sunflower seed. Until that fateful day, when the decision was made to throw together a gluten-free granola for The Yak. Packets of those grey and green coloured things were purchased. After a good toasting, there was a tasting (because a good cook should) and guess what? I liked them. I really liked them. This gluten-free recipe is from The Gluten-free Kitchen cookbook by Sue Shepherd. 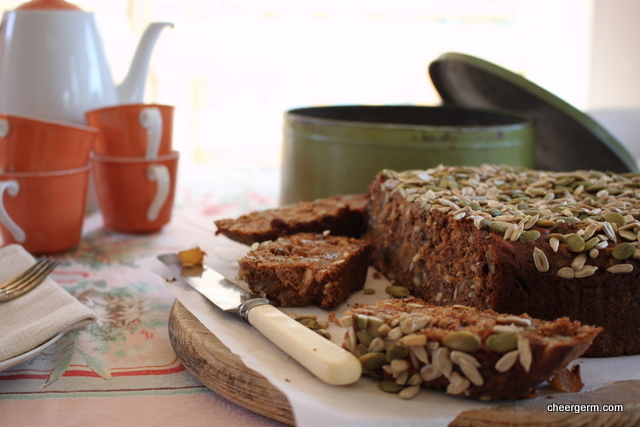 It is definitely what you would classify as a ‘health cake’ and The Yak (self-proclaimed taster) and cohorts have all proclaimed it as a toothsome and moreish concoction. Dense and fruity with an intense blend of cinnamon, nutmeg and cloves that will make your head spin. 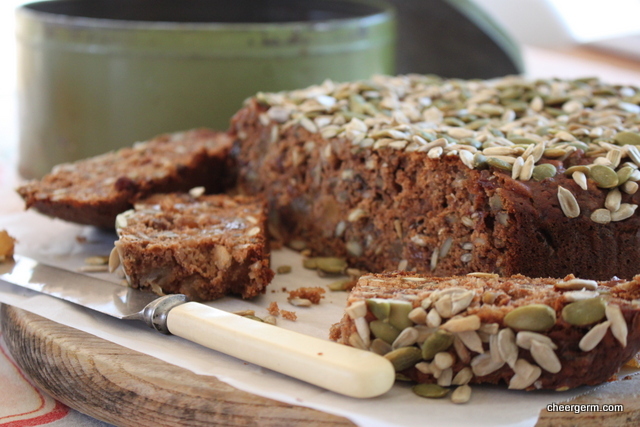 This cake is savoury, earthy and studded with a plethora of seeds and nuts. A small piece goes a long way and your body will thank you. 1 tbl ground flaxseed or 1tsp Xanthum gum. Both are optional but I used flaxseed. Preheat the oven to 160C. Grease a 20cm springform cake tin and line with baking paper. Stir until the sugar has dissolved , then increase the heat and bring to the boil. Boil for 1 minute, then reduce the heat and simmer for 2-3 minutes. Transfer the mixture to a large bowl and cool to room temperature. Sift the flours, baking powder, bicarbonate of soda and flaxseed/Xanthum gum (if using ) into a bowl. Repeat this process three times to ensure they are well combined. Or whisk really, really well. Add the eggs, pecans, sunflowers seeds and pumpkin seeds to the cooled fruit mixture, then stir in the sifted flour mixture. 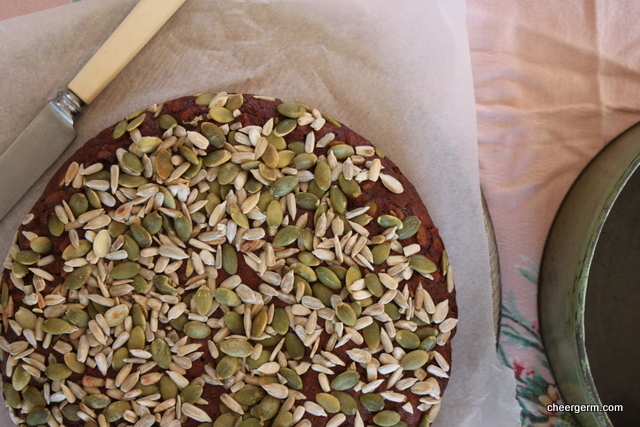 Pour into the prepared cake tin and sprinkle the extra sunflower and pumpkin seeds on top. Cover with foil and bake 50 minutes, then remove the foil, rotate the cake tin and bake for a further 10 to 20 minutes or until a skewer inserted into the centre of the cake comes out clean. Remove onto a wire rack, let the cake sit in the tin for 15-20 minutes, then remove carefully onto the wire rack and let cool completely. 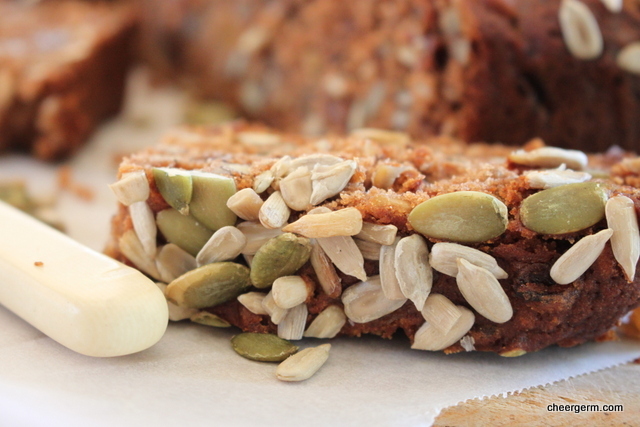 If allergic to nuts you could substitute the pecans with extra dried fruit and seeds. Rotating the cake tin ensures more even baking. I have also been reading about about grinding sunflower seeds in a spice blender or NutriBullet type doohickey, and adding them to baking. Kids, watch out. This entry was posted in Family memories, Gluten free baking and desserts and tagged baking, cheergerm, Cooking, food, gluten free, gluten free baking, gluten free fruit nut and seed cake, healthy, pumpkin seeds, recipes, Sue Shepherd, sunflower seeds. Bookmark the permalink. Hahhaa, Full circle. Will you pop a slice in the lunchboxes of the Junior Yaks? I’m with your Mum- we old hippies knew more than just smoking the odd herb occasionally. It looks really tasty. I could have this for breakfast in lieu of muesli! Seeds are not just for the birds!! Yes, you almost could as it is dense and a little loaflike. Ha ha, yes, I have seen the light and seeds ain’t just for the birds. Sounds like we had quite opposite childhoods, although now share similar tastes. I grew up on a steady diet of cookies, candies and chocolate bars, so I turn with joy to the newly discovered health food treats like nuts and seeds. This cake certainly looks lovely, although the ingredient list is rather daunting. Maybe I’ll get my sous-chef of a son to tackle it! Different paths, same destination Mel! It does look a tad daunting but it’s not too bad. It really is a cake worth baking. The pineapple and tart cherries add a wow factor. Sounds like a job for the sous chef! Wow, hope this doesn’t kick off another sunflower seed addiction Mrs H! 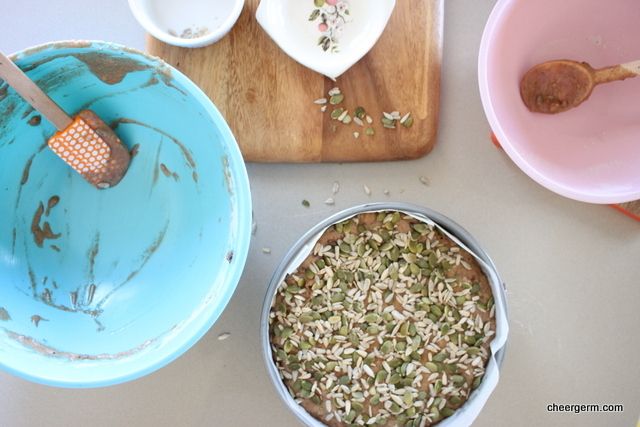 If you are a fan of these ingredients you will really enjoy this cake. If you don’t care about gluten free, you could just substitute the flour for the same weight of a mix of plain and wholemeal flour. And see what happens, I haven’t tried doing that yet! I just love the little stories that go along with your recipes each week…..makes the final product even sweeter! Now thats a healthy slice. Love it, all the seeds and fruit, a healthy dose of delicious. It sure is, will cure what ails you! Most importantly, it tastes good. Phew! This does have echoes of Christmas fruit cake which I confess I’m not a big fan of but this has more nuts than Xmas cake, so I could be convinced. 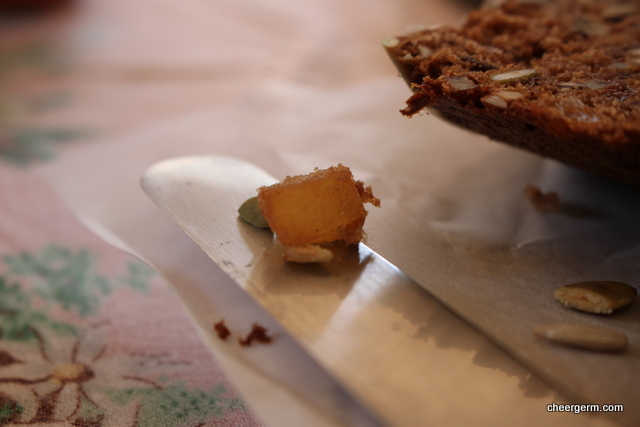 Husband is the fruit cake lover in our house (and baker, too, since I don’t really like it) and he takes a couple of slices with him when he goes x-country skiing, almost like an energy bar. Your photos are beautiful and tempting! Double urgh – glacé cherries. Does the loaf keep forever like Christmas cake? I’d definitely have a slice if it was just kicking around, looking nutty and yummy in the fridge. It will last a few days but not much longer than that. Fruit cakes containing a lot more dried fruit and alcohol last longer as they are self preserving due to the booze and the lack of water in the dried fruit content, meaning it keeps longer. 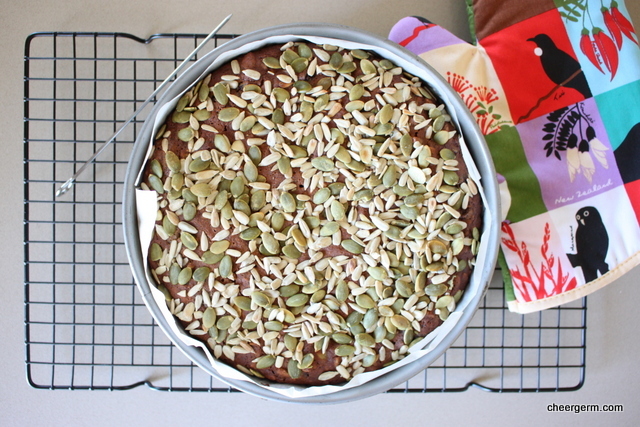 This cake has a lot of seeds and nuts so it is generally a bit drier. Wow! Your mom was not playing around and just as well because now look. Look what you gone and did. 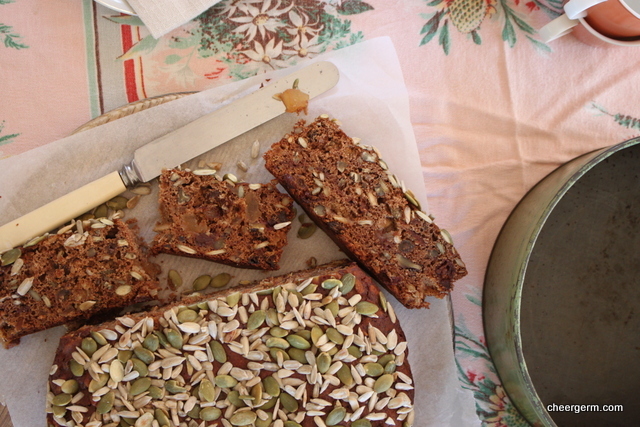 Made this yummy loaf crammed with these things, making ol Cake over here suddenly hungry. Like your mother used to I’ll happily scatter seeds into and over my food. Mostly in salads. I just don’t want to shell either of them, as I tried to roast pumpkin seeds last year – what a nightmare to shell! 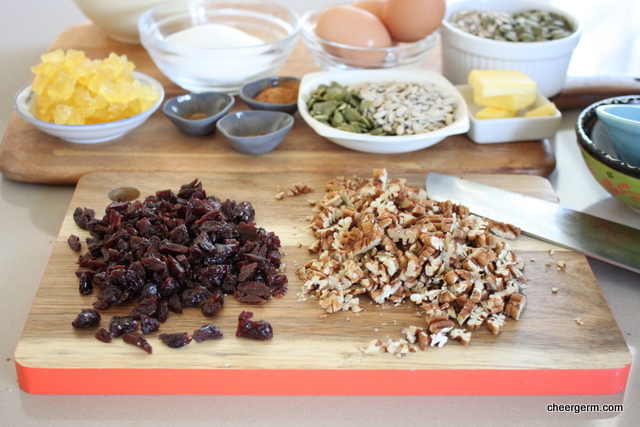 Fruit cake is on the list of things to make. Hopefully soon. I am finally on that scattering seeds page too but deshelling them is far too much hard work! Good on you for giving it a shot though? 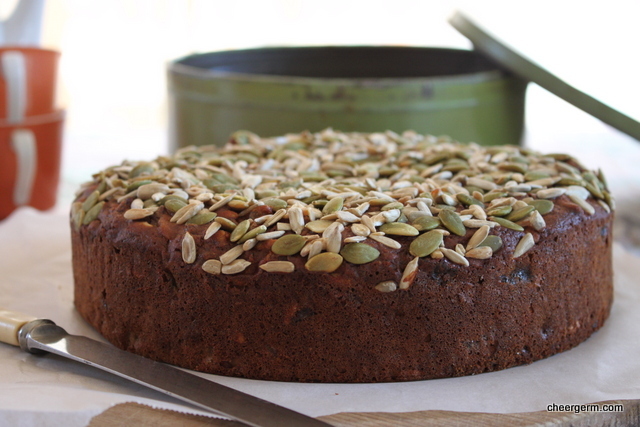 This was a quick and easy fruit cake and I will be baking it quite regularly. 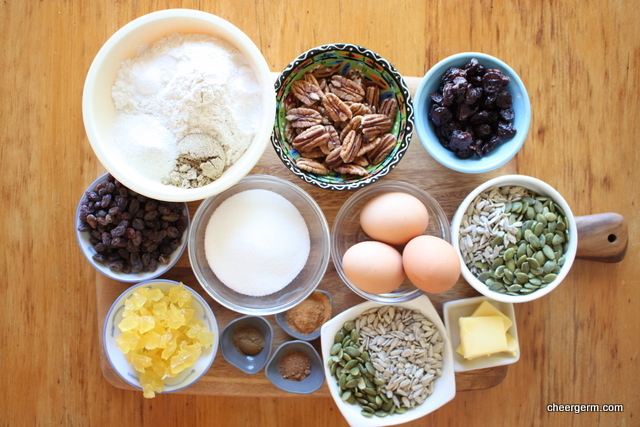 Good luck with your fruit cake, those lists of things to cook are like the Neverending Story!! LOL at the caramel mud cake. 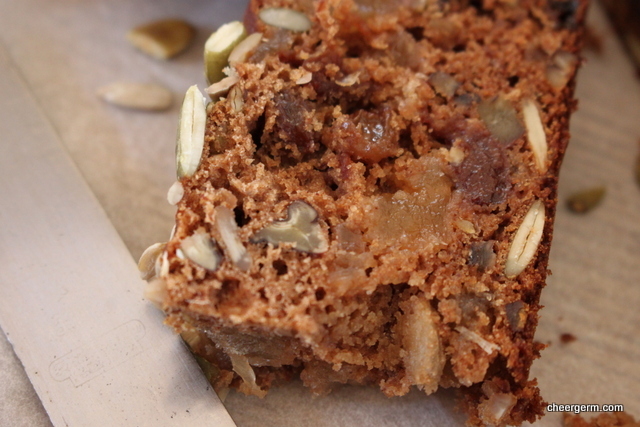 You can fool some of the Yaklets some of the time… I like the sound of all the fruit and nuts in this cake. Definitely a good breakfast item. I’m very fond of sunflower seeds too (and sunflowers) but I’ve always had trouble with pepitas. They seem more husk than seed. I know..I had such high hopes for that cake but the texture was just revolting. Gack. 😂 This really is a great wee cake and I am surprised I like it as much as I do! I still don’t think I would eat a handful of pepitas alone either but I don’t mind them mixed in with another bunch of stuff! Not having the hippy association that you have (although other things spark that connection), I’ve always liked sunflower seeds (pumpkin seeds, too, but nothing will induce me to try to extract the kernels after once trying). We use them a lot – mostly in place of nuts as there is a nut allergy in the family. Love this cake (in spite of the pecans, which I personally adore, but usually have to leave out). It is really wonderful that you can use something from your childhood and come full circle – more a spiral as we never are in the same place twice – and make something delicious that everyone will enjoy. Thanks KW and so true, more a spiral. Nut allergies would mean no pecans but I think extra fruit and seeds, maybe throw in some hemp seeds too for good measure and it would be just as lovely. Yes, shelling those wee kernels is not for the faint hearted!